Bottom Line: Statistically significant associations were observed between e-cigarette use and recent smoking cessation in Greece. The associations were stronger for recent (≤3 years) smoking cessation, which is compatible with the rising popularity of e-cigarettes, and for daily e-cigarette use. The findings suggest a positive public health impact of e-cigarettes in Greece. There is substantial progress in smoking cessation in Greece over the last few years since e-cigarettes became popular. A strong positive association was observed between current e-cigarette use and being a recent former smoker. 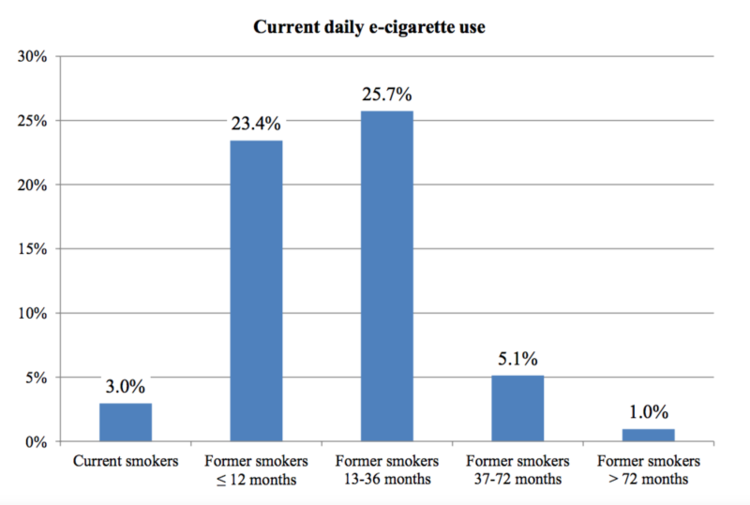 This provides indirect evidence that the progress in smoking control could be at least partially attributed to the rising popularity and use of e-cigarettes. In this study, current e-cigarette use was strongly associated with smoking cessation for ≤ 12 months (26.2%) and 13–36 months (27.0%). Current use was not significantly associated with smoking cessation for 37–72 months and was negatively associated with smoking cessation for > 72 months. The associations between e-cigarette use and smoking cessation were much stronger for recent quitters than for former smokers without considering the duration of quitting. The strongest associations with recent smoking cessation were observed for daily e-cigarette use, indicating the importance of examining the frequency of use. The strong negative association between current e-cigarette use and quitting for >72 months might be explained by the unavailability and low popularity of e-cigarettes in the previous years. This finding is reassuring that e-cigarettes are not promoting relapse to nicotine use or use of an inhalational habit among long-term former smokers, which is in agreement with findings in the US. When former smokers were sub-classified according to quitting duration, current e-cigarette use was associated with approximately tenfold higher chance of smoking cessation for ≤12 months and an elevenfold higher chance of smoking cessation for 13–36 months compared to any other pattern of e-cigarette use (including never use).